Haiti National Palace: A working meeting was organized following the 18 November 2018 street protests between President Jovenel Moise; the Prime Minister, Jean-Henry Céant; the president of the Court of Cassation and the Superior Council of the Judiciary, master Jules Cantave; Senate Speaker Joseph Lambert and Speaker of the House of Commons Gary Bodeau. This meeting, held as part of the ongoing dialogue between the three state powers, was an opportunity for the heads of the executive, the legislature and the judiciary to assess the current socio-political situation with a view to bring concerted responses. 3) Intensify social appeasement programs. " The leaders of the three powers have agreed to find the harmony necessary for a better functioning of the state, said the statement. 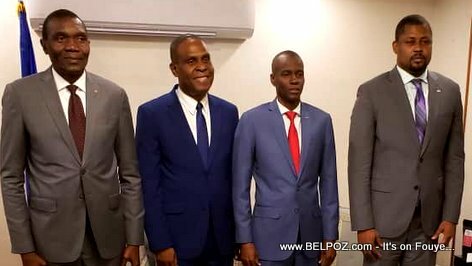 The day before, Jovenel Moses had already called for dialogue. The hard wing of the political opposition represented by the so-called democratic and popular sector rejected this call for dialogue and asked the population to stay at home until the departure of the head of state. "There is only one option. Jovenel Moses is a political corpse that must be brought to the cemetery. It's over for him. We can not do anything with him anymore. He must leave without delay to avoid chaos ... ", fumed Me André Michel, spokesman of the sector. According to him, it is impossible to carry out the trial of PetroCaribe with people in power who participated in mocking.